Genesis Rolo to the Rescue (USA) in 09:04.55 by Aqfaq. Rolo to the Rescue is a platformer for the Genesis, starring an agile elephant, Rolo. 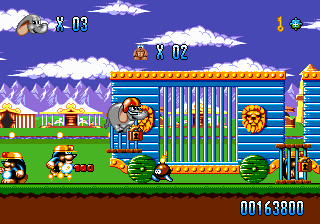 Gameplay involves freeing animals from cages. Switching to the saved animals allows for different movement modes, which adds some puzzle elements. The overworld is assembled by getting pieces from clearing stages. By herself, Rolo can only take one hit, but the animals she frees will take a hit then leave the group. Rolo is a perfectionist, anything less than 100% gets the bad ending, which is quite dark for a game that seems aimed at kids.